Sharing with you some healthy & yummy treats I discovered from Yummy Organics. I’ve raved about how I love two brands distributed by Yummy Organics Philippines before and you can read about it here. Yummy Organics Philippines offers the best of healthy premium British food and drinks. They currently have eight brands and so far, I’ve tried five brands. Clipper Tea prides itself on being natural, fair and delicious. 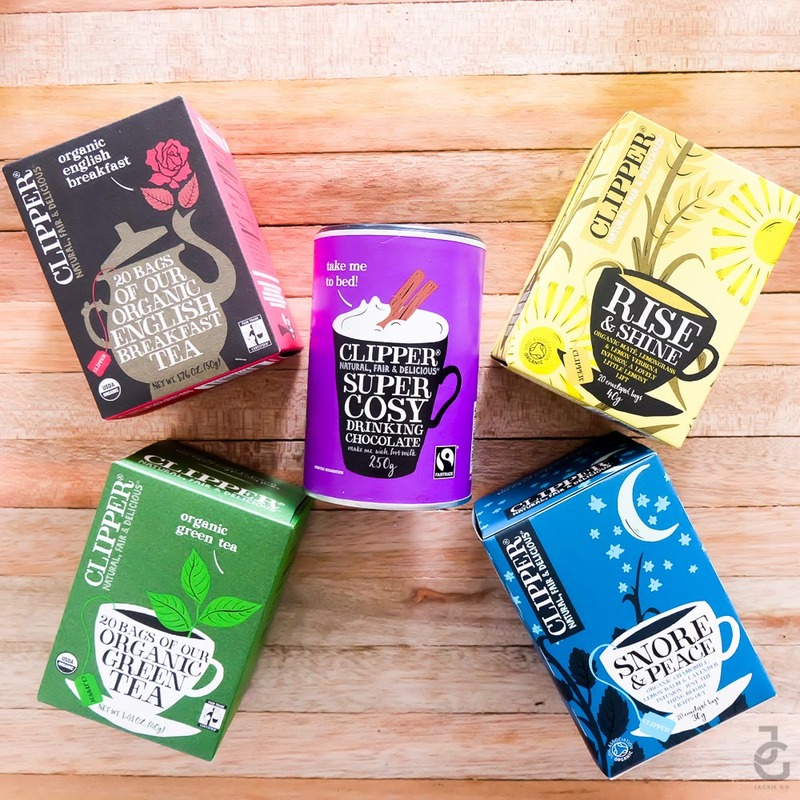 From the all-natural and organic ingredients they use, to their certified fair-trade suppliers, Clippers has made a vocation of providing consumers with organic, ethically made and, of course, great tasting tea. With a wide selection of flavors, ranging from the perennial favorite Green Tea, to more “occasion-based” choices, such as their Snore & Peace (best suited for turning down after a long day! ), Clipper Tea always makes sure to go back to what it does best- being natural, fair and delicious. Oh, and just a tip: while they are primarily a tea company, their Clipper drinking chocolate is, to sat the least, amazing! Organic tea flavors include: Green Tea, Chamomile, Peppermint, Lemon & Ginger, English Breakfast, Earl Grey, Rise & Shine, After Dinner Mints, Snore & Peace, and Love Me Truly. I personally, love Clipper Tea Green Tea & Drinking Chocolate. They have this certain charm that comforts me every time I make a cup for myself. I haven’t tried Snore & Peace yet but I think this will greatly help me turn in especially on nights when my nocturnal instinct kicks & screams. Dorset Cereals comes from Poundbury, located in the historic county of Dorset, from which the company gets its name. Inspired by the gently rolling hills and winding country lanes, Dorset Cereals believes that life is too short to settle for second best, and that simple, honest pleasures are the most rewarding, which is why they use honesty, tasty, real ingredients in all of their mueslis, granolas and more. 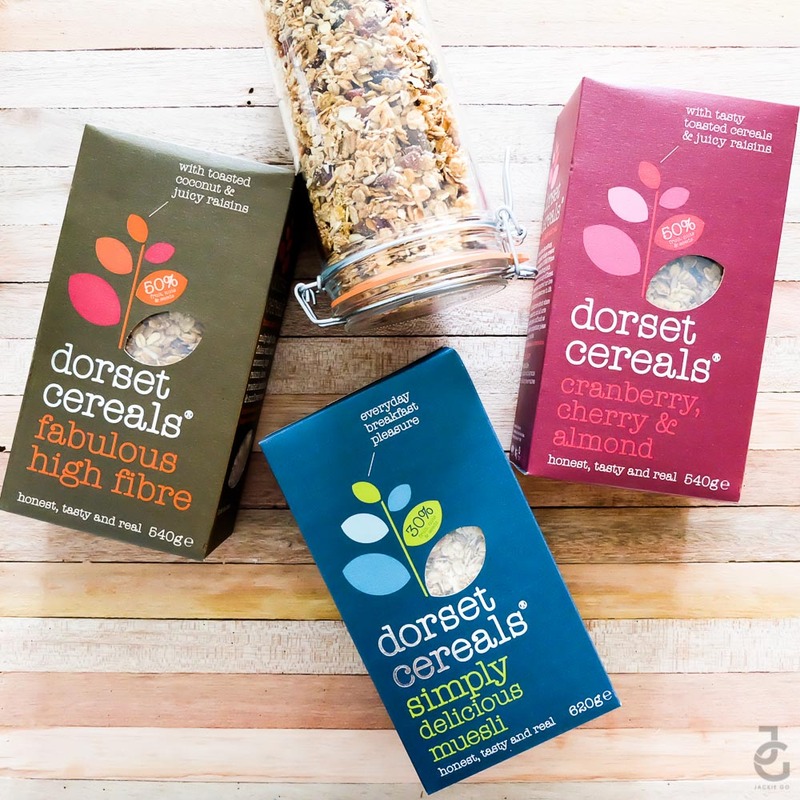 With increased fruit and nut content per gram, every spoonful of Dorset Cereals’ all-natural offerings is bound to bring a smile to your face as you are reminded of the unique, honest beauty of the simple things in life. Flavors include Simply Delicious, Simply Fruity, Really Nutty, High Fiber, Cranberry Cherry Almond, Berries & Cherries, Honey Granola, and Tasty Toasted Flakes. I am not big on breakfast at home (that’s why I love hotel breakfast buffets heehee). I don’t go all out because my kids go to school early and they prefer finger food that they can munch and eat easily either at home or in the car. So pastries and cereals really come in handy in our household. We like adding different variants of cereals to our pantry so I was pretty excited to get these Dorset Cereals from Yummy Organics Philppines. My favorite is the Cranberry Cherry Almond while Mr. JG prefers the Muesli (because he loves the soaked muesli like that in hotels- which reminds me, I still need to learn how to make that). Sometimes, I scoop a handful and put it in a zip lock bag and throw it inside my bag so when I get stuck in traffic or get hungry in between meetings, errands or work, I have a healthy snack to munch on. Teapigs is on a mission to educate the world about the wonder that is their real tea – not the dusty stuff found inside most teabags. Armed with their tea temples, unique pyramid-shaped containers for the all-natural whole-leaf teas they source from all over the world, as well as an exceptional quirky sense of style, the Teapigs gospel is spreading rapidly! 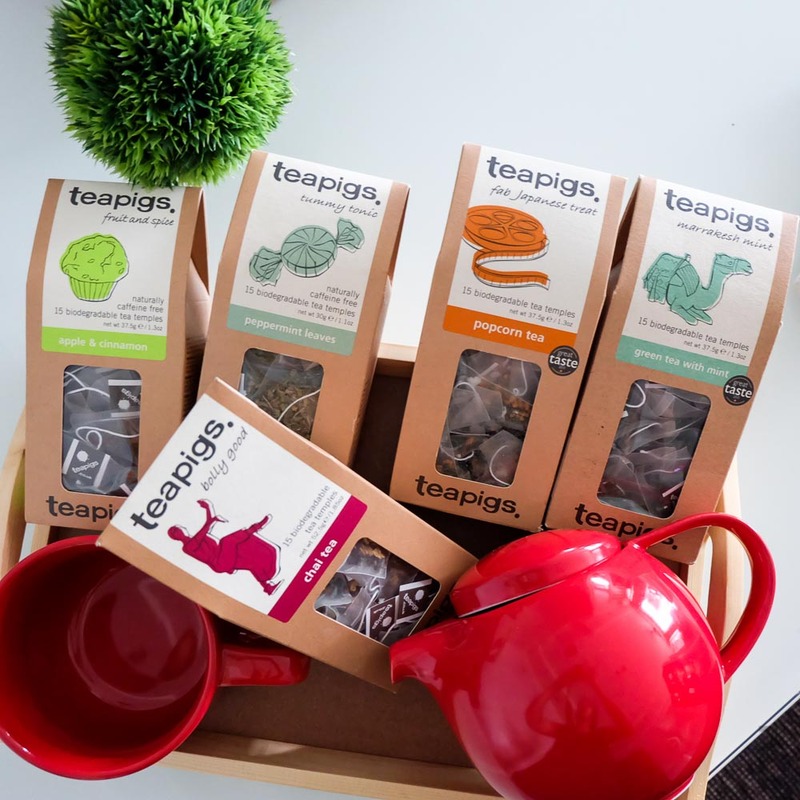 Their flavors range from the traditional green tea, English Breakfast to the innovative (and best-selling_ Popcorn Tea and Roobos Créme Caramel, but all remain consistent and faithful to the core Teapigs idea: that tea drinkers deserve only the best, real tea. Flavors include Chamomile Flowers, Chai, Liquorice & Peppermint, Lemon Grass, Lemon Ginger, Peppermint Leaves and Apple & Cinnamon. Teapigs is one of the two brands I’ve first tried from Yummy Organics. It had me at Popcorn because it just tastes so good, I couldn’t stop having it whether hot or iced. Now it has become a staple tea in my pantry because of how uniquely delicious it tastes. The Berry Company is all about – what else?- berries! It’s a family-run business that has been producing a wide range of delicious and healthy products for nearly a decade now. Their berry juices are all natural, rich in antioxidants, have no artificial colourings, additives, preservatives or sweeteners, and all taste amazing! The berries they use range from the more familiar blueberries and raspberries, to acai berries (which are a known superfood! ), goji berries, and more. 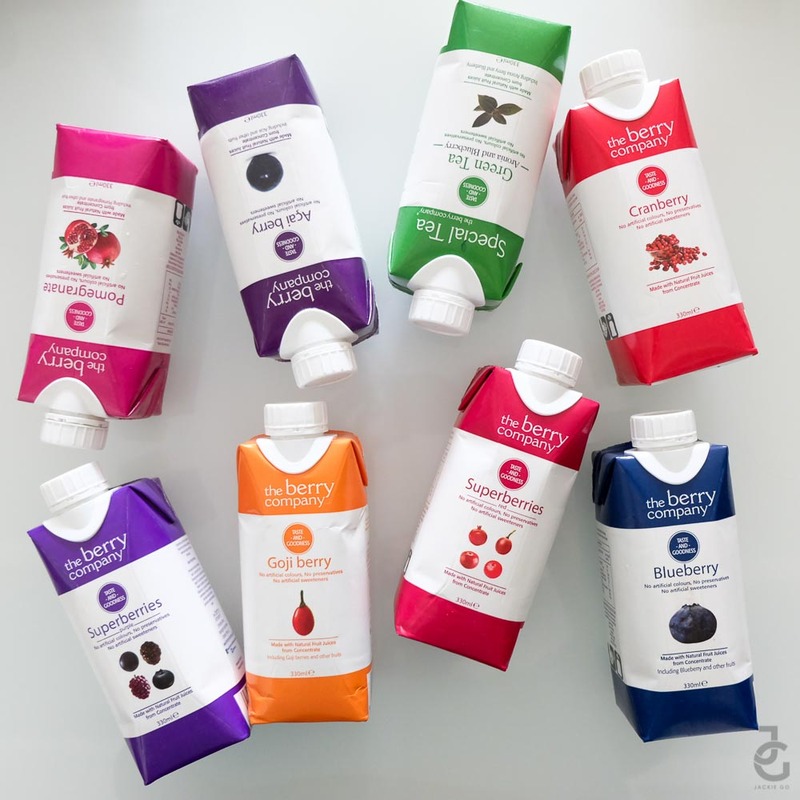 Among all of these flavors, the berry company’s devotion to clean living and healthy lifestyle choices remains evident, consistent and delicious! The flavors include Acai Berry, Goji Berry, Superberry Pruple, Superberry Red, Blueberry, Pomegrante, Cranberry, Green Tea with Blueberry and White Tea Peach. They come either in 1 liter or 330 ml solo packs. To be honest, I’m not a juice type of girl. Mango, pineapple and coocnut are the only (canned or boxed) juices I drink, sometimes orange too. But after I’ve tried these The Berry Company juices, I’ve become addicted to them! Surprisingly, they taste sweet which now makes them part of my juice list. I never thought I’d love another juice flavor aside from mango. I like that they’re all rich in antioxidants and are all natural. Still can’t believe I have healthy beverage choices that taste good! These Yummy Organic brands are available in selected branches of Rustans Fresh Supermarket, SM Supermarket, SM Hypermart, SM Savemore, Robinsons Supermarket, Puregold, Waltermart, Metro Gaisano, NCCC Davao, Iloilo Supermart, Landmark, Hi Top Supermarket, Makati Supermarket Alabang, Unimart, Cash & Carry, CVC Supermaket among others. For a complete list of stockist, click HERE. Thanks again Yummy Organics Philippines for introducing me to more UK brands. I have more options when it comes to eating and drinking healthy food and drinks. Do you sell wholesale? I have coffee shop and find your products shoot on my coffee shop. Hi Alejandro. These aren’t my products I just featured them. Please contact the website I listed at the end of the post. Thanks!